There’s still time to make yourself a needle felted lapel pin like the one I made today on Take Five & Company. Here’s what you need to do to make your own. Step 1: Stack the two felt heart cutouts on top of each other and place on top of the foam piece where you will be working. I poke around the shape with my needle about a dozen times to secure the two pieces together before applying wool. Step 2: Add a small piece of wool and secure to the craft felt backing by poking vigorously with your needle. (Keep your fingers out of the way because it really hurts when you poke yourself with one of these needles.) Continue adding roving until you have covered the entire surface of the heart shape. 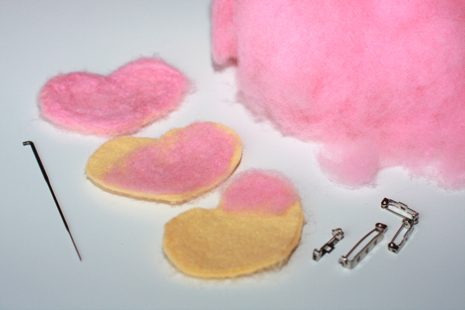 Step 3: Hand sew a pin back to the back of your felted heart, pin to your lapel or sleeve and brand yourself V-day ready. *** And if your feeling a little anti-Valentine’s Day this year, don’t rule out this project. 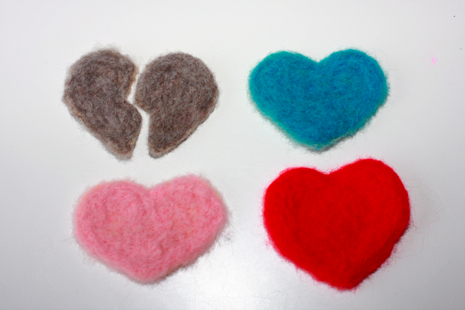 Poking a felt heart repeatedly can be a very cathartic experience. And why not express yourself through craft? If you’re not feeling cheery, your crafts don’t have to be sugary sweet. If you have issues, by all means needle felt them out. I made the broken heart below as a tribute to teenage heartbreak. We’ve all been there and it totally stinks. Use what you feel and make something cool. I bought my wool and needles from my husband’s great aunt Rita Walters who raises sheep at Mar-Rita Farm in Hastings, Michigan. You can contact her at metamarieta@yahoo.com. The good news is now that needle felting has grown in popularity, you can buy supplies at most local craft shops. And any yarn shops that teach spinning classes are sure to stock wool roving. Have fun and remember to be careful so you don’t poke yourself. crafting on TVNeedle FeltingWZZM Channel 13 "Take Five"